To this day I can close my eyes and see the images within my boy scout manual; my favorite, a soft pastel drawing of a night scene, tents surrounding a campfire, and in the background a giant red rock arch. I have wanted to visit Arches since that moment, but on our last trip to Utah there wasn’t enough time. However it is said if you seek you shall find, upon seeking I found a needed training class for work which so happened to be in Utah on a Monday. My boss Jason gave me the go ahead. Yet knowing us too well all he could imagine was me entering class Monday morning sleep deprived, delirious, blue skin, snot-cicles hanging from my nose, half frozen, limping on a compound fracture, only to bleed out after roll call. He and countless others continually reminded me of the temperatures, the limited time available, and the distances we had to travel to pull this off. Fortunately I have a severe clinically diagnosed case of selective hearing. Leaving work on a Friday afternoon, Lauren and I flew into Salt Lake City landing around 12:30am. The rental company warned us of poor road and weather conditions, again “selective hearing”. Heading toward Moab at 1:00am we turned on the radio. Our musical selection included the Mormon Tabernacle Choir in three “not differing” forms or static. With such an eclectic selection we opted for silence. Around 4:30am I was drinking my 4th-5th large cup of coffee and taking “stay awake” pills from random truck stops .At some point the caffeine level balanced the trucker pills and I began to taste colors, and see sounds. I’m not sure, but I think I saw a purple anteater driving a semi truck, and a few scenes from Fantasia acted out on the hood of our rental car. It is also possible that we drove through a Pink Floyd Laser Light Show as I had an existential conversation with a Unicorn. Pulling into the hotel parking lot in Moab I have never been so excited to release my frozen white knuckled death grip from a steering wheel. Two hours of sleep and it was time to go. Arches National Park has a harsh beauty seen in every detail of the terrain. Red Rock formations set the foreground framed by majestic blue skies, and a background of snow capped mountains blurred by the distance to which they rest. Helen Keller couldn’t take a bad picture here, I know that’s just wrong. Every frame of each scene offered a new and exciting play on light, line, and color. With my grandfathers 35mm we set out to experience through his lens the beautiful things he never got to see. Lauren and I hiked the well marked 3.5 mile trail to Delicate arch, and as I focused the image I was drawn to a moment of reflection. This camera was about to fulfill my childhood dream, at the same time it was fulfilling a dream my grandfather never got to realize. Time always wins, but occasionally it gives us a parting gift. As the shutter opened and closed, time allowed his camera to capture an image he longed to take, yet in the hands of his grandson. I did not grow up loving photography. Until last year a point and shoot was all the camera I needed, but sometimes a legacy is a matter of time. I don’t have my grandfathers eye for light, or his craft in the darkroom, but in that moment I knew he would be proud. 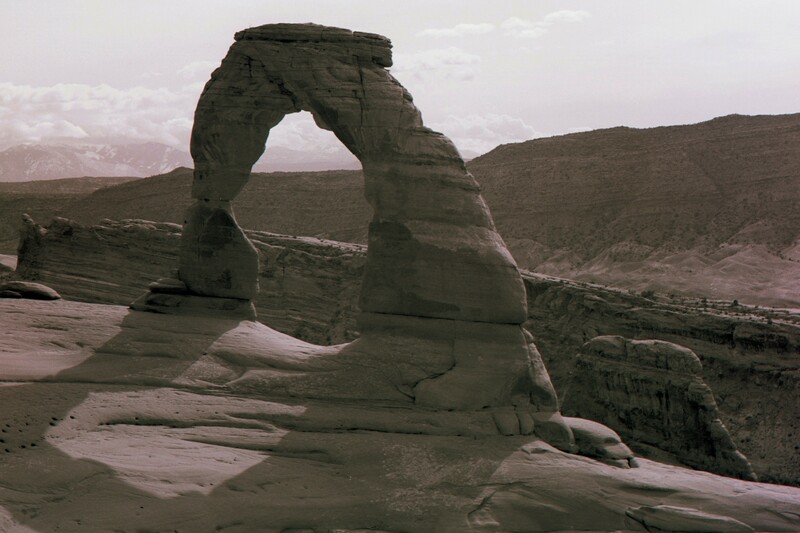 Delicate Arch shot with 1976 Canon AE-1. Paw Paw, you may be gone but you are not forgotten. You take amazing landscape photos. Thank you so much. As a hobbyist I always feel a great level of insecurity. Your compliment is greatly appreciated. Thank you so much, I really enjoy your blog, keep up the awesome work, and thanks for stopping by.